A CNC machine integrated turning and machining for complete processing from raw material including cutting, milling, tapping, drilling and even grinding. 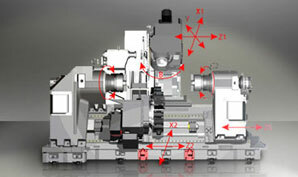 The tool spindle with both B and Y-axis functions can be used for both offset and angular machining. It is designed to fulfill to high speed, ultimate precision and flexible which are major demands of machine tool market nowadays. The machine is built on a low gravity one piece bed with two built-in spindles, equipped with a tool spindle with both B and Y-axis and magazine tool exchanger and a lower turret to complete numerous machining variations. High cost of labor, shortage of skillful operator, and the limit of production floor space are the general problems of industrial production. The trend of future industrial production must meet the concept of Done in One-- it is integrated machine.